Publishes his first book of many - "Abolition of Zamindari, Two Alternatives"
Publishes Abolition of Zamindari, Two Alternatives. 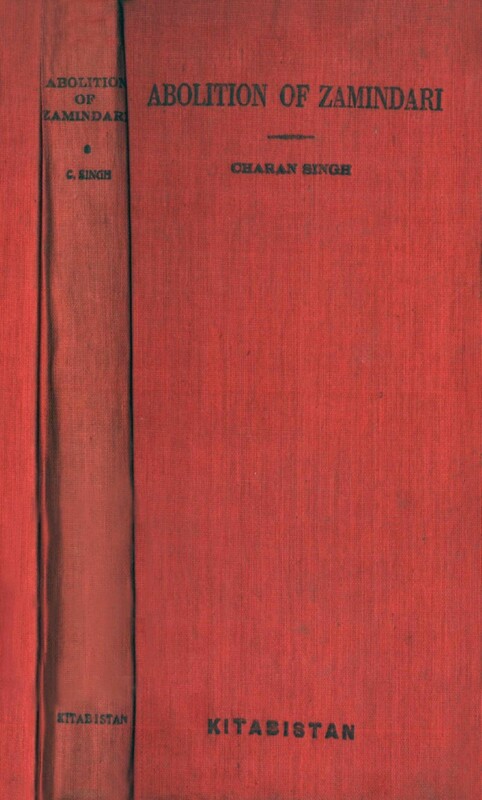 Charan Singh’s views on peasant farming and agriculture in India start taking shape, deeply influenced by worldwide trends. This is his first book, and the scale of his reading is evident in the bibliography (given below). Hubbard, Leonard Egerton. Economics of Soviet Agriculture, London: MacMillan And Co, Limited. 1939. Marx, Karl. The Communist Manifesto (later Manifesto of the Communist Party), 1848. League of Nations. European Conference on Rural Life. Geneva, 1939. Howe, Frederic C. Denmark: A Cooperative Commonwealth. London: Allen & Unwin. 203 pages. 1922. Warriner, Doreen. Economics of Peasant Farming. Oxford University Press, 1939. Fei, Dr. Hsiao Tung. Peasant Life in China. London: Kegan Paul. 1938. Buck, John Lossing. Chinese Farm Economy, University of Chicago Press, 1930. Jordan, Virgil. Businessmen's Commission on Agriculture, National Industrial Conference Board and Chamber of Commerce of the USA. New York. 1926. Nanavati, Sir Manilal Balabhai and Anjaria, Jashwantrai Jajantilal. The Indian Rural Problem. Indian Society of Agricultural Economics. 1944. Masani, Minocher Rustom ‘Minoo’. Socialism Reconsidered. Bombay Padma Publications. 1944. Author not found. The Land and the Peasant in Rumania. Dantwala, Prof. M L. Gandhism Reconsidered. Bombay: Padma Publication. 1944. (Leading Indian agricultural economist, 1909-198?). Mukherjee, Dr. Radhakamal. India Analyzed. 1934. Shridharani, Krishnalal. The Mahatma and The World. New York: Duell, Sloan and Pearce. 1946. Narayan, Jayaprakash. Why Socialism? All India Socialist Party, 1936. Government of India. UP Agricultural Reorganization Committee. 1939-41. Government, British. Agricultural Tribunal of Investigation, 1923. League of Nations Publications. 1940. Agricultural Debt Redemption and after in Bhavnagar State. 1937. Nanavati, Sir Manilal B. Final Report of the Famine Inquiry Commission. 1945.